will be. Every tree is different, and therefore each one of them will cost a different amount to remove. can stuff be dropped straight to the round or will it all have to be lowered down on ropes, and what the access is to the tree among many other things all will be determinate of how much it will cost to have it removed. In the urban environment trees often are planted in very tight spots, and are allowed to grow very large right next to, and over things such as your house or other buildings. When this is the case, a climber will have to climb up into the tree then use chainsaws and ropes to precisely take the tree apart piece by piece. There is a lot of skill and experience involved with this type of removal, and always inherent risk to all involved in the removal process as well is to the valuable structures below. who is very qualified to do the work. Sure there are guys who you can find in the classifieds who claim they can do the work, and will do it for a lower cost then a legitimate tree care company, but most of the time they carry no insurance, and they don’t have the skills that are truely required to do the work. and your family, do you really think that during its removal is the time to save a few dollars? No. 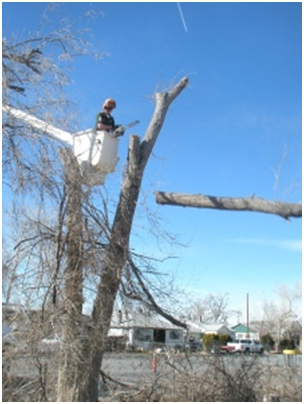 Tree removal is a very dangerous operation requiring lots of skill and experience, so make sure that you find a qualified company. Good luck, and once you have found a qualified company to remove that tree, be sure to have your cameras ready when they come to take it down, its like nothing you have ever seen before. Should I be worried about my tree falling over in the wind? 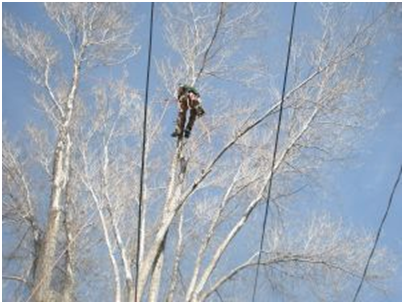 Copyright © 2011 Associated Arborists. All rights reserved.